We are almost halfway through the second semester at our high school. The other day a colleague told me he looked forward to “resetting” his classes to start the fourth quarter. Schools set a lot of rules. Each classroom has its own subset of rules and procedures. Predictably over time, enforcement of certain rules grow lax and behaviors slip. The beginning of a new academic season, especially after a break, is a good time to adjust and reaffirm rules and expectations. Then you crack down to ensure discipline. It’s only fair that way. If your dress code states: “Students must tuck their shirts in,” that’s your rule. It’s in the handbook. But if you never systematically enforce that rule, in two weeks 95% of the student body will be walking around with their shirts out. Yes, the principal could, midway though the year, start randomly walking into classrooms to throw kids in detention for untucked shirts. But students would be surprised and (rightfully) feel resentful of this tactic. Morale and performance would suffer. Once a behavioral norm has been established, the best way to install new discipline is to do a reset. Ponder the goals and efficacy of your rules. Reiterate– and perhaps modify– the rules so they best serve the mission of the school. Start afresh. Our immigration laws need a reset. There are at least 11 million undocumented immigrants living in the United States. The laws haven’t been enforced consistently, this is business as usual. These individuals–men, women, and children– are woven into the fabric of our communities. 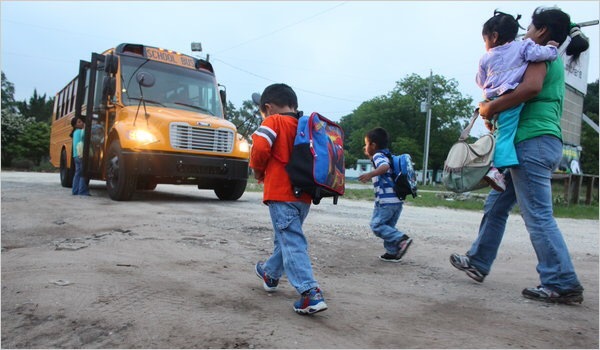 Children brought here as infants have grown up, are graduating from our schools and starting families of their own. People migrate here primarily for opportunity. Americans hire unauthorized immigrants to work. There is a demand for their labor. It’s not easy to come legally, and it’s not easy to go back and forth across the border– to work seasonally on farms, for example. An estimated 65% of unauthorized immigrants from Mexico have been here for over a decade. Let’s put aside the economic and safety arguments. Despite the scapegoating, research shows that immigrants–authorized or not–commit fewer crimes than American citizens, and contribute a net positive to the economy. Besides, the rate of immigration has actually reversed in recent years: more Mexicans are leaving than arriving. But let’s put the “worthiness of immigrants” question aside and grant that the U.S. should have clear immigration laws that are followed and enforced. If so, how should we proceed? It is not practical, or ethical, to round up and deport 11 million people. It would cost a boatload of money. It would disrupt communities, turn cities into police states. It would separate families. It would create more lawlessness, as immigrants of all stripes would fear calling the police to report crimes. “Amnesty” is a dirty word in politics, but it’s the only alternative. Let people who are here stay. You can argue what their status should be, but unless you provide a path to citizenship, you create a permanent sub-class of Americans. That’s more problematic than full integration. As part of this reset you can establish a new enforcement mechanism. The wall is expensive, impractical, and antagonistic. Given this pressure, I imagine companies would lobby for easier work-permit systems, allowing more workers to come and go across the border. In our system of government, the Congress writes the laws. According to the letter of the law, we have 11 million people here illegally and subject to deportation. The job of the president is to enforce the laws written by Congress. Previous presidents have understood concepts like “practicality” and “basic human decency,” and have enforced immigration laws accordingly. The Congress desperately needs to update our immigration laws. Remove from the hands of this president the power to terrorize immigrant communities under the guise of law and order.